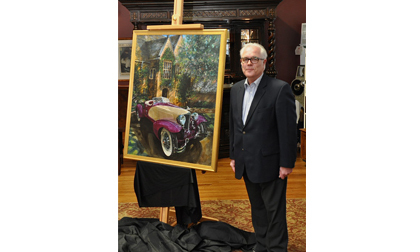 CHESTERFIELD, Mich., Feb. 18, 2016 – On Tuesday, February 9, Automotive Fine Arts Society (AFAS) member Jay Koka unveiled his original work which was commissioned to be the official poster for the 2016 EyesOn Design Automotive Exhibition at Stahls Automotive Foundation in Chesterfield, Michigan. Koka, a master of impressionist art, is known for his ability to manipulate color and mood to create automotive masterpieces. In addition to the poster, Koka’s artwork will also set the tone for the EyesOn Design car show taking place on June 19, at the Edsel & Eleanor Ford House in Grosse Pointe Shores, Michigan. The 2016 EyesOn Design poster features a gorgeous 1931 Cord L-29 “LaGrande” Speedster parked in front of the Edsel & Eleanor Ford House. The car pictured is the so-called “lost Cord,” believed to have once been owned by movie star Jean Harlow; it disappeared after exhibitions in New York, Toronto and Paris in the 1930s. Celebrated by audiences around the world, Koka’s art has been featured at many international events over the years. His work has graced posters for the Pebble Beach Concours, the iconic Daytona 500 and legendary 24 Hours of Daytona and the Barrett-Jackson car auction, as well as several other automotive events. Koka’s original paintings, as well as a catalog of his more than 150 prints and poster editions are featured at www.jaykokastudio.com and www.autoartprints.com.